If you missed it, here are Part 1 and Part 2 of my race recap. Ah the run. I’ve read many things about the Ironman run portion, but nothing can prepare you for it. Races are easily won and lost on the run course – poor nutrition or pacing on the bike can come back to haunt you on the run. Given that I am trained the most in running and that at Oceanside the run was my strongest leg, I had hoped to run the majority of the marathon at around a 10 min/mile pace, with some walking through aid stations and hills, of course. Well, ladies and gentleman, Rick was certainly right. Nothing can prepare you for the fatigue of running a marathon after 112 miles of cycling and 2.4 miles of swimming. I’ve heard that the Ironman run is a mental battle rather than a physical one and it was certainly that. I started the run off feeling actually fairly well. I saw numbers in the high 8 min/mile range at first and slowed down to the low 9s. Running through the crowds of downtown CdA was fun and I was smiling with joy at being off the bike and onto the run with nearly 8.5 hours left to complete a marathon. I was high-fiving kids in the crowd and smiling ear to ear. I knew I would finish. Crowd support means everything at these races! The run course was MUCH more entertaining than the bike course. Now that the sun was shining (it seemed HOT – sunny and in the 70s) and it was mid-afternoon, people were energetic and excited to cheer us on. After we ran through the streets filled with restaurants and shops, we headed into residential area where people were partying outside their homes, blaring music, shouting and ringing cowbells. About ¾ of a mile into the run I saw the lead pro woman (being led by a motorcycle that had sign telling me so) running toward the finish. Soon after that I saw Mike, and for some reason in my head I figured that he must be also about to finish. I said hi and yelled at him “1 more mile! You can do it!” It wasn’t until after he passed that I realized that clearly Mike didn’t make up the 40 minute head start the pros had and that he had one more lap to go. Duh. However, the next thought of Mike catching up to me so that we could race together was a good one, and for the next several miles I waited for him to catch me. Nothing better than seeing your best friend on the course! Starting with the first aid station, I started a routine of pouring ice down my bra and I grabbing a sponge and squeezing it on my head and then putting it in my tank top just over my heart (Thanks Macca for the tip). The sun felt really hot and I knew I needed to make sure I didn’t overheat. Since I was carrying my water bottle with Nuun, I didn’t have to take any of the food or drink at the aid stations and I had taken a Gu right out of T2 so I was set on nutrition for a while. Everything was going fine until just before I made the turn out of the neighborhood and onto the long out and back portion that parallels the lake. My heart suddenly was beating really fast – my Garmin said my HR was in the mid 200s. I freaked out and for the first time, stopped to walk. I was disappointed – I didn’t want to walk and feared that this was a sign of bad things to come. Doubt began to creep into my mind – what if my body wouldn’t let me run? What if I had to walk? What if I passed out and they took me out of the race?! I waited for my heart rate to calm itself down, and then started running again, this time at a slower pace. I wouldn’t be seeing a 9 in front of my pace again for the rest of the race.I had hoped that the marathon wouldn’t be very painful for the entire 26.2 miles. At Oceanside, I felt really good on the run for pretty much 10 of the 13.1 miles so I figured maybe at IM CdA I’d feel good for at least half of the marathon. I had also read in Going Long that if you paced and nutritioned right on the bike (which I felt I had) you should be able to run a marathon abotu 20 minutes slower than a recent open marathon time. I recently ran a 3:49 marathon so I should be able to run a 4:09 marathon at Ironman, right? Unfortunately that wasn’t the case. My legs were heavy and it was a mental battle from the start. 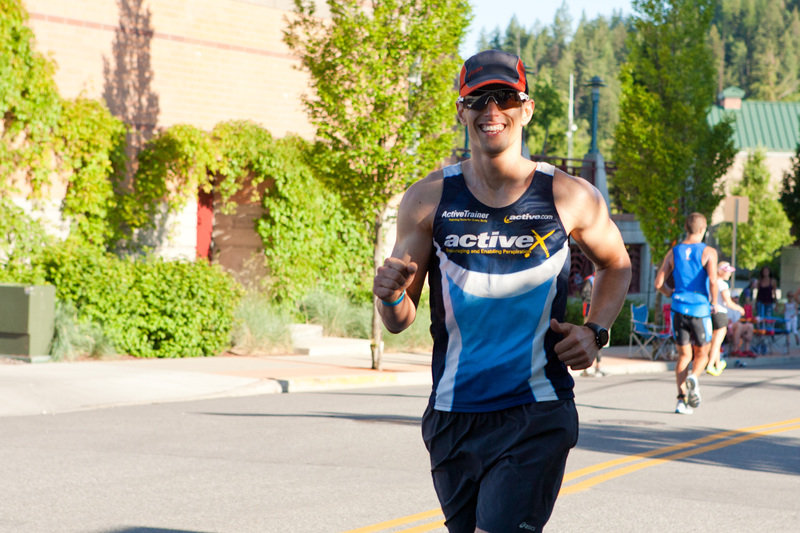 Ironman Coeur D’Alene is considered one of the more difficult Ironman courses due to a few factors – a cold, choppy swim, a hilly (and previously, very technical) bike course, and a hilly run. I had heard about the hills on the run but when we biked them, they didn’t seem so bad. However, on this day, the hills seemed daunting. Since I was feeling fairly good (in retrospect – at the time I thought I was doing pretty bad), I was able to run about half of the hills. I would run until my heart rate got a little high and then I’d walk and repeat. On my way out I saw Katie and a friend of Mike’s from work who were on their way back. I kept hoping for the turn around and it seemed to take forever to get there! Turning and heading back to town was a relief – now I just had to focus on getting to the halfway point. Wet sponges helped with the heat! After I climbed and descended the large hill again, I saw Mike, who was now nearly 5 miles behind me rather than 2. I asked him how he was doing and he gave me a thumbs down. Later I learned that he had felt great for the first lap but then suddenly his stomach was really upset (read his great race recap here). He sat on the side of the course with a few cups of chicken broth until he felt better and then got a second wind. I also saw Rachel and waved to her. Shortly after, I caught up to Katie a little ways later and we ran together for the next four miles or so. She was running a bit slower than me and told me I could go ahead, but I gladly slowed down and ran with her. I figured I probably needed to pace myself a bit better and I also knew that mentally these next few miles would be easier with a friend to chat with. Katie and I chatted about the race and in the meantime I kept my eye out for Asia, who I figured I’d see on my way back to town. Katie asked me about my teammates and I mentioned not seeing Asia but that I probably just missed her or something. At this point my stomach wasn’t feeling great. I had kept up with my Gu every 40 minute routine until now and had even taken a few salty potato chips (these were the ONLY thing that tasted good on the entire run course) and was continuing to drink water. However, my food didn’t really feel like it was digesting. I also had taken a couple of electrolyte pills since I wasn’t planning on drinking the Ironman Perform electrolyte drink and I knew it was really hot. It felt like everything was just sitting in my stomach. As we got back into town, Katie and I both shared that we would be stopping to see our families when we got there and at the last aid station before the turn around, I stopped to go pee (pit stop #5!) and she went ahead. When I got to my parents at nearly the halfway point, I stopped and gave them hugs and immediately proclaimed “it’s so hard!” We took some photos and they wished me luck and said they’d see me in a few minutes after the turnaround. I took off, heading to the turnaround, which was one block North of the finish chute. I could hear Mike Reilly calling athletes in and was quite jealous that they were finished! The second lap was even harder than the first, naturally. As soon as I passed the turnaround, I slowed to a walk. I wanted to run by my parents but couldn’t even get myself to run up the street. As soon as I knew I’d see them, I started running again to save face. I felt like crap. I walked every aid station and poured ice down my shirt and took turns drinking Coca-Cola or chicken broth and occasionally eating chips. I gave up on Gu – the thought of having another one made me want to gag. Going through the neighborhoods the second time was harder and the music and crowd entertainment wasn’t quite as entertaining. All I could think about was how unbelievably painful it was to run, yet every time I walked, running was harder so I didn’t want to walk either. Not to mention, my pace going up hills was 30 min/mile – I had to run when I could, otherwise I’d be out there all day. Although I knew that I would finish, negative thoughts were popping in my head. Why would I subject myself to such torture? Why in the hell did people race Ironman over and over again, knowing that they would have to put up with this pain!? I thought of Maria, who told me that she knew I wasn’t a “one and done girl.” I’ll show her! I’m never doing this stupid race again!!! As I was about to exit the neighborhood, I saw Mike! We stopped and gave each other a hug and a kiss. It was so nice to see him and instantly lifted my spirits. He was feeling better and was about to become an Ironman for the 2nd time. I was so happy for him. Once I got back on the lake front course, I ran past someone who turned and said “Nicole!” It was Brian, a guy I had met on Twitter who was also competing in his first Ironman at CdA. He started jogging and we ran together for a bit, talking about our days. He told me that he had seen me a while back and he knew I would catch him. When we approached the next aid station, he slowed to a walk and told me to go ahead. I later saw him on my way back to town and said hello again. Mike out of the pain cave and ready to finish! Now I was on the alert for Asia. I wondered why I hadn’t seen her yet but it never crossed my mind that she might not be out there. I was also looking for Jeremy since I figured he shouldn’t be too far behind Mike. I didn’t see either of them and began to get worried. Finally, about ¼ mile from the turn-around, I saw Jeremy, who was walking up the hill as I ran down it. I said to him, “You look a lot different than the last time I saw you” and he said “I’m in the pain cave.” Team WODS was not having a great day! After I turned around and headed back, I caught up to Jeremy, who was also walking the downhill. I knew something was wrong when I saw that. We lamented to each other about how hard the race was – that it was harder than we expected and that we both figured we would NEVER do an Ironman again. Jeremy went as far as to say he didn’t want to even run a marathon again and that qualifying for Boston seemed stupid. He was in a dark place – a place I had been just a few miles prior and a place that Mike had also visited that day. Then I asked about Asia and he said that when he saw his family at the turnaround they said they still hadn’t seen Asia get off the bike. He said he was afraid she missed the bike cut off. I started to get worried too – the thought had never crossed my mind that she wouldn’t make it. I convinced Jeremy to run with me for a bit but he fell back and told me to “Go become an Ironman.” I told him I’d see him at the finish. I got a second wind after that. I was now in the home stretch – it was time to get this done. I knew the more I walked, the longer I had to be on the course. I already knew that my crazy Sub 12 hour finish thoughts on the bike were not happening, but I also knew I had plenty of time to go Sub 13. I could even go Sub 13:30 if I kept up the pace. I continued my strategy of running between aid stations and only walking hills. I gave up on solid food completely and switched mostly to Coca-Cola and water since the chicken broth didn’t seem to be helping and I knew it barely had any calories. At one point I started to run with a guy from Chicago who lamented that this course was ridiculously hard compared to his first Ironman at Texas. He said something to the effect of “ Every time you turn, there is another damn hill! Hills everywhere!! !” I later saw him at the finish line and we congratulated each other on the race. The Ironman really is a day of highs and lows. As a consistent runner, I was passing people left and right. On the first lap, the stronger athletes were still on the course and many of them were running. Now all of them had finished and many of us were on our 2nd loop and many were starting their 1st loop after having much slower swim and bike legs. It was a death march for many. My high 10 to low 11 minute miles were helping me make my way up in the field. Later I found out that I passed 400 people on the run. In my mind, however, I was kicking myself to having to walk so much and running a pace I had never seen before. I did, however, take pride in the fact that I was still able to run. The spectator support through the final miles was awesome. Through the neighborhoods, everyone was cheering me on. Throughout the day I had been called out by my bib number or by name (which was printed on my bib) and also complimented on my neon pink running outfit. The comments and compliments increased even more as I made my way through the final miles, especially since I was one of the few people running. At this point, I knew Asia hadn’t made it and I nearly came to tears thinking of how upset she must be to have not been able to complete this journey. The finish line is a slight decline (thank you, race directors) down Sherman Avenue. The streets are lined with thousands of spectators. As I turned the corner and saw the finish line and heard Mike Reilly’s voice, I was overwhelmed with emotion. I nearly came to tears thinking about the last year of hard work as well as the physical battle I had been in for the last 13 1/2 hours. As I made my way down the chute, I started to speed up to a mid 8 min/mile. The heaviness in my legs disappeared, breathing was easy, and all that mattered was that I would be an Ironman in the next few seconds. The crowd was going wild. I felt like a celebrity walking the red carpet. People were shouting my name and my number – I was all alone running down the chute. Soon a woman passed me and I let her go, even slowing a bit so that I could have my own space. I veered to the left so I could get closer to the spectators and started slapping their hands as they held them out for high-fives. Then I saw Jeremy and Asia’s families, and then Asia. She was cheering for me and I looked at her and made a sad face, tears welling up in my eyes, now knowing for sure that my good friend and training partner’s (we’ve raced 2 half marathons and 2 marathons side by side) Ironman dreams hadn’t been achieved that day. After I passed the WODS Squad, I saw my parents cheering for me along with the nice new friends they had made. 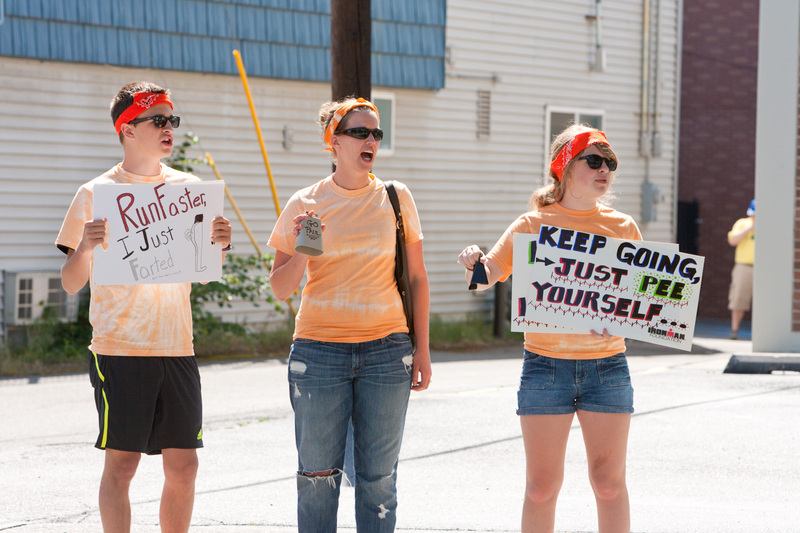 It seemed everyone was there to cheer for me as I made my way down the final few yards to the finish line. All the pain, frustration and negative thoughts I’d endured for the last 26.2 miles no longer existed and were all worth it. I didn’t even look at my time, I just relished in the moment, throwing my arms up and jumping into the air as Mike Reilly spoke the words that would induct me into the small group of human beings that call themselves Ironmen. I loved reading your race report!! Your achievement is remarkable, and you look fantastic!! Pink suits you! Congratulations!!! You are one amazing woman Nicole! Great reading, great accomplishment! Tears. I’m not kidding you. Tears right now. So, so amazing and you are such an inspiration. Congratulations on a strong run, the great time and becoming an Ironman!!!!!!!! Awww thank you! I can’t wait for your big day so I can cheer you on as much as you cheered for me! Thanks for all the support!!! I LOVED reading your reports, Nicole. Congratulations again!! 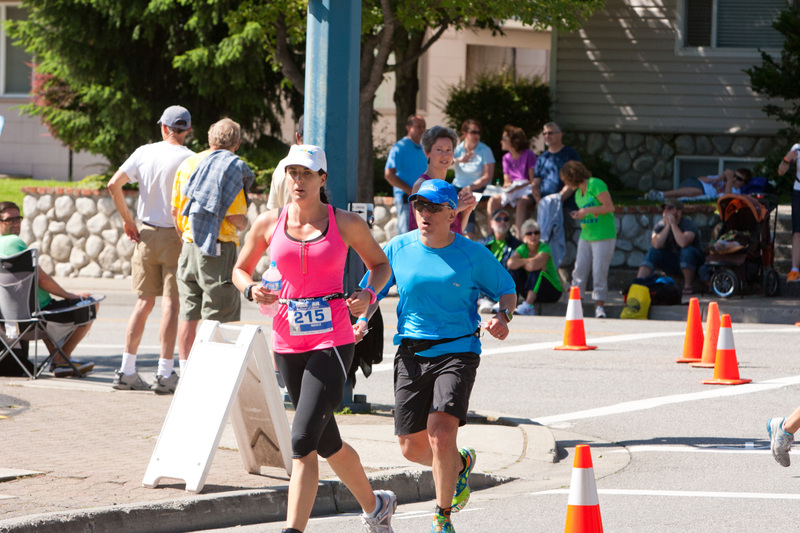 The pink top was a fabulous choice for the run; I can’t believe how strong (and great) you looked! Thank you! And thanks for all your support through training! Can’t wait to hear how IM Canada goes for you! I’m sure it’s a different experience racing a IM for the second time! Love, love, love this! So happy for you! Well done! Congratulations! I enjoyed reading your report!